In America's vast and ever-expanding car culture you can find many definitions of cool. There are rarities with long stories and big exclusivity. which are bought to be shown. talked about and referenced. There are purpose-built performance machines that are tailored to specific activities or events. There are chrome-laden cruisers. which honor former eras and bygone lifestyles. And then there are pieces. 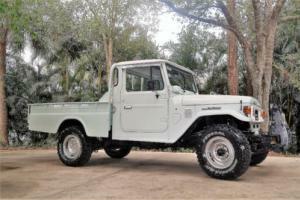 like this utilitarian Land Cruiser. that are easy to own and just a blast to drive! Fully-sorted and professionally polished. this trail blazing Toyota is one of the toughest and most capable SUVs ever built. And. thanks to a recent frame-off restoration. it's just as versatile on the show field as it is in the mud. If you're looking for a cool classic that's fun. unique and ready to hit the road. this rugged FJ is just your style! Born from practicality and wartime necessity. 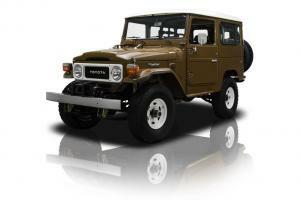 the Land Cruiser began life as a reverse engineered Bantam GP that Toyota assembled for the Imperial Japanese Army. The truck's rugged construction and tidy proportions proved extremely useful when it came to transporting soldiers. towing equipment and all-terrain motoring. And eventually. circa 1953. Toyota decided to market its proven creation directly to civilians. 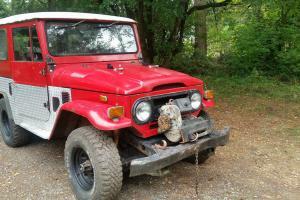 This 1979 FJ40 is the beneficiary of a frame-off. rotisserie restoration that involved heavy stripping. through sealing and lots of buffing. With the truck's body worked all the way to bare metal. every panel was POR-15 treated. with special attention paid to any paint-to-paint connection that might encourage future rust. When that preventative cured. its surfaces were layered in a heavy coat of DuPont Nason FulThane. which manifests a correct Appenino Brown and Olympus White color combination. And presently. this Toyota's Rhino-inspired body wears a wet-looking finish that shoots glares and casts reflections better than ANY old school factory pigment. Aesthetically. this Cruiser is pretty predictable. But I mean that in a good way. It's an excellent incarnation of the tough. boxy persona that populated the sports utility segment until the early part of this century. 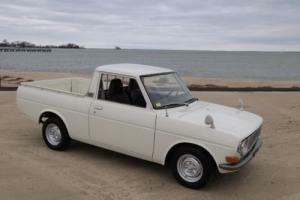 The only difference being: this truck's 'open' bodywork trades pure form for productive function. Up front. a bright white grille centers a simple "TOYOTA" badge between Hella H4 headlights. fender-mounted parking lamps and an NOS bumper that's fitted with a rare. PTO-driven winch. At the sides of that grille. tough vertical panels hang removable doors behind silver mirrors. flush fitting handles and gnarly Land Cruiser scripts. At the top of those panels. a bright white roof seals like-new glass behind a hinged windshield. satin-finished wipers and a sculpted hood which features stainless latches. And at the back of that roof. familiar ambulance doors swing a full-size spare and NOS tag lamps around fresh "TOYOTA 4 WHEEL DRIVE" badging and a two-tone bumper that's capped with clear tail lights. Mechanically. 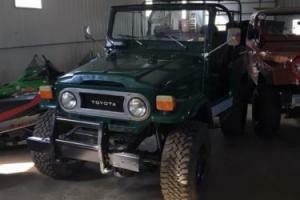 this FJ separates itself from other restorations by having every major service concern addressed. including expensive transmission. transfer case and axle rebuilds. Unfurl its lightweight hood and you'll find a 135 horsepower 2F 6-cylinder that looks good and runs great. Based on General Motor's stalwart Stovebolt Six. Toyota's famous overhead valve mill isn't a grossly overpowered piece. But it's certainly proven its ability to get this compact 4x4 out of many tight situations. and tow just about any moderately sized toy its owners can imagine. At the top of the black block. restored air induction pipes wind to a fresh Weber 38 carburetor. At the base of that carb. a silver. "2F" branded valve cover caps factory intake and exhaust manifolds. At the base of that valve cover. a DUI HEI distributor sequences spark through beefy LiveWires plug wires. And the truck's clean engine bay is dotted with many trail ready essentials. including a new radiator and proven Duralast battery. Originally built to mimic America's hella tough Jeep. this old school SUV features part-time four wheel drive and enough ground clearance to give new meaning to the phrase 'stump jumper'. The truck's rugged 4-speed utilizes a Centerforce Dual Friction clutch and tall. 3. 70 gears to serve up an awesome combination of off-roading prowess and inclement weather capability. Modern power steering combines a familiar Saginaw pump with a smooth billet pulley and Bill Dorry brackets. New-for-1976 front disc and rear drum brakes have been swapped for all discs. all the time. The truck's chassis. which rides on a cool combination of solid axles and tough leaf springs. has been augmented by an Old Man Emu/Dakar suspension kit. 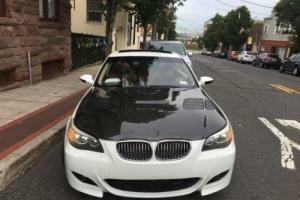 Exhaust is handled by factory replacement pipes and a subdued sounding muffler. At the corners of the floor. powdercoated wheels spin 33x9. 50 BF Goodrich All-Terrain T/As around new Warn hubs and simple. NOS center caps. And. as far as appearance goes. the bottom of this clean Toyota is exactly what you'd expect from a lightly used restoration; proving that. while this Land Cruiser IS exceptionally nice. it's certainly not something you should be afraid to get dirty. Inside this classic. you'll find a spacious and comfortable environment that has enough room to be your vehicle of choice for any weekend adventure. The professionally restored seats. front bucket and folding. opposing rear jump. are wrapped in high quality vinyl. There's a rare. NOS floor mat that proudly shouts "TOYOTA". In front of the driver. a boxy dash hangs a warp-free pad over clear gauges. restored knobs and a Toyota-branded radio delete. Below that dash. a trio of shifters. one for the 4-speed. one for the 4-wheel drive and one for the winch. ride between a small console and restored heaters. Opposite those heaters. NOS door panels. which display virtually no weathering. frame small plastic handles and traditional window cranks. At the top of those panels. a new headliner is only broken by an OEM roll bar. which is properly painted and fitted with a complete set of rare. NOS pads. And the driver stays connected to the road via a factory-issue steering wheel. Ready for show and ready to go. this unique Toyota is one very cool SUV that. thanks to its frame-off. rotisserie restoration. has received every mechanical rebuild imaginable. A coveted 1979 model. it would be right at home parked with other classics. pulling up to a hot dive. or perched on a mountain conquering your latest Saturday adventure. Super nice. professionally restored Land Cruisers are virtually impossible to find; don't miss your chance to own the nicest one we've ever seen! Please note that all sales are binding and final. Our cars are sold "as-is" with no warranty expressed or implied. Please carefully read the terms & conditions of the sale before bidding. 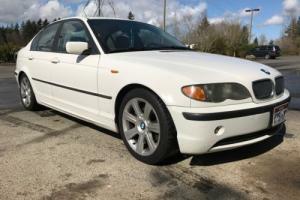 Winning this auction does not entitle you to come inspect the car and decide if you want to buy it. but obligates you to complete the purchase! A $1000. 00 deposit via PayPal is due within 24 hours of the auction close . NO EXCEPTIONS. If you have ZERO feedback on eBay. 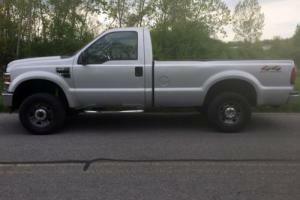 please call or email us to request our authority to bid on our vehicles. We do not release our reserve prices. as this would be unfair to the other bidders. so please don't ask! Each and every one of these cars is listed on eBay. but only one sale. on average per month. actually occurs on eBay. If you see a car you like. don't wait! Call us! When you see it disappear from eBay. it means that it was sold by other means. Because we advertise heavily in other mediums. we reserve the right to cancel any eBay listing at any time. If you would like to make a sales visit or arrange an inspection. we would be happy to schedule a personal appointment with either yourself or your representative. To do so. contact Frank Carroll at (704)596-5211 or (440)413-7118. Frank's email address is: Frank. Carroll@RKMotorsCharlotte. com. For those of you who need to fly in. we can provide transportation to and from Charlotte Douglas International Airport. We can also recommend accommodations within a short distance of our facility. RK Motors takes pride in delivering road-ready cars to our customers. That's why every car we sell comes with the assurance of our Seal of Approval process - a comprehensive inspection performed by our sister company. the RKM Performance Center. From major visual defects to basic functionality issues. our Seal of Approval checklist covers the basics so you can feel confident about your purchase. For international buyers. note that we've shipped cars to collectors and classic car fans world-wide for years. We can provide you with a firm quote for transport to any shipping port in the world in a sealed container and handle the process for you from start to finish. Our domestic and international ground transport solutions are enclosed only. If you wish to use an open carrier. you will need to arrange that. Our Transportation Manager. Anthony Conner. stands ready to help you with your transport & shipping needs. Anthony can be reached at: Anthony. Conner@RKMPerformance. com. A common question we receive is: "do you accept trades"? We do accept trades. but will only consider #1 or #2 condition vehicles. If you would like us to review a trade. please send recent. high resolution pictures of the entire car. including the underside. Also send a detailed description which includes all specifications. facts. figures. history and documentation present with the car. Lastly. give us a clear idea of what you are seeking in trade value. If you are a MyClassicGarage user. you can send us an Evaluation file for review. Our MCG virtual garage name is: RK Motors Charlotte. Email information and pictures on your trade directly to Frank Carroll. Frank's email address is: Frank. Carroll@RKMotorsCharlotte. com. Our 60. 00 sqf retail showrooms are located in beautiful Charlotte. North Carolina . We usually have 200-250 incredible cars on display. and there's always something new. Feel free to make an appointment. stop in and meet our staff. and. more importantly. see the Greatest Showroom on Earth! Each and every one of our employees is an absolute car nut and we do this because we love cars! In addition to our retail showroom in Charlotte. NC. the RKM Performance Center is located in a 40. 00 sqf facility in Mooresville. NC. which is about 20 minutes north of Charlotte in the heart of NASCAR country. We perform complete restorations for classic car collectors worldwide. RKM restored cars have won numerous national awards. Check out our feedback from other customers who have purchased cars from us in the past on our website. We pride ourselves on describing our cars accurately. and. our cars really do look better in person than in the pictures! Every car that you see for sale is in our physical possession and located at our main facility. 5527 Lakeview Road. Charlotte. NC. 28269. For general information. call us at: (704)596-5211.